Farming leaders committed to zero emissions but it is not clear they know what that is. An informal group who describe themselves as farming leaders have issued a joint statement committing themselves to the Government’s goal of net zero emissions by 2050. They include Federated Farmers, Dairy NZ, Beef and Lamb, Fonterra Shareholders Council and the Meat Industry Association. Hopefully this will be a good strategy but the big problem is that most of this group have not shown much in the way of understanding and quality leadership on the issue of methane emissions to date. Federated Farmers spokesman Andrew Hoggart said that the organsiation was heartened that impacts on the economy and a more nuanced view of different types of greenhouse gases were gaining prominence in the debate on climate change. They may well be heartened by this but they can take no credit for it nor call themselves leaders on this issue. Federated Farmers members have been frustrated for years at the Federation’s refusal to advocate for them to get the role of methane understood. It is all very well to go in to bat for your members now, once organisations like Pastural Farming Climate Research have done all the hard work and taken all the heat, but that is not leadership. Dairy NZ’s chief executive Tim Mackle likewise has led an organization that has been keen to take farmers money and use it against them. For over a decade Dairy NZ have been providing farmers with misinformation about the role methane plays. And they still are. Dairy NZ’s chief executive officer Tim Mackle does now finally admit that the science shows methane did not need to be reduced to zero but, he maintains that it does need to be reduced. “We know methane needs to reduce and we welcome the opportunity to work with the Government on just how much that reduction needs to be” he told the media. Well we don’t know that Dr Mackle. There is no scientific consensus that methane needs to reduce and Mackle is misleading farmers once more. There is significant scientific research showing that reducing methane will have no impact at all on peak global temperatures. If the goal of net zero by 2050 is achieved, emissions of greenhouse gas will continue to increase the atmospheric concentration of CO2 until the year 2050, at which time it will be held constant by CO2 emissions being 100% offset. So fairness and parity and science dictate that methane emissions can likewise continue to increase the atmospheric concentration of methane until the year 2050, at which time it will be held constant by emissions being stabilized. So no reduction is required now or even in 2050 for methane emissions to be at net zero, they only have to stabilize, as they are now. The Motu report, which was written by a number of NZ scientist, confirmed last year that in order to stabilize the climate methane emissions do not need to be reduced, they just have to stop increasing. This move by the so called farming leaders to support net zero by 2050 may be a good strategy but with misinformation still spewing from its members such as Dairy NZ, it is not a good sign that it will be. Dairy NZ has commissioned a number of climate ambassadors and of course Federated Farmers has its representative roles so I suggest if you are unfortunate enough to be a financial contributor to either of these organisations, hold them to account and pull them up on their lack of leadership and their misinformation. Dairy NZ levy payers have every right to demand Mackle backs up his statement and provides his evidence. If any of his ambassadors spread this nonsense ask them for proof. If you want to send Mackle or his ambassadors any information to show how wrong he is download our carbon report and send the relevant parts to him. Better still send it to those who review his employment performance as well. Is spreading misinformation to the detriment of farmers one of his jobs? 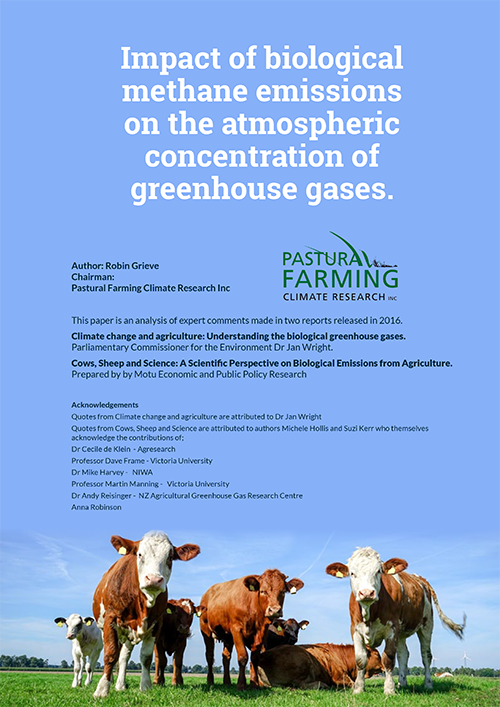 Pastural Farming Climate Research will continue to bat for farmers on this issue as even though we have made significant progress the job is not done yet and the farming industry, as is demonstrated in this post, lacks the good leadership it needs to ensure we win on the methane matter.